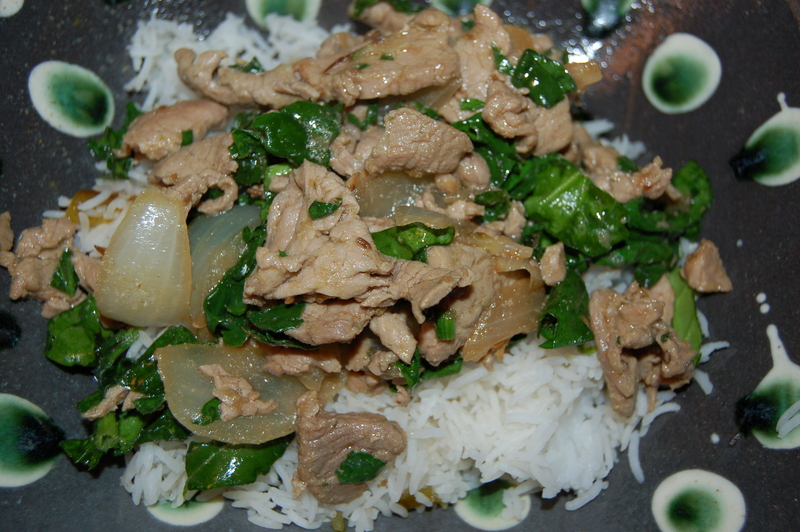 pork stir-fry | Crappy Kitchen - Good Dinners! I find that most people use pork tenderloin for a quick roast dinner. They may rub a few herbs on it, or wrap it in bacon (all delicious methods by the way), as well as it being a popular choice for a summer barbecue. I like it for a different reason. 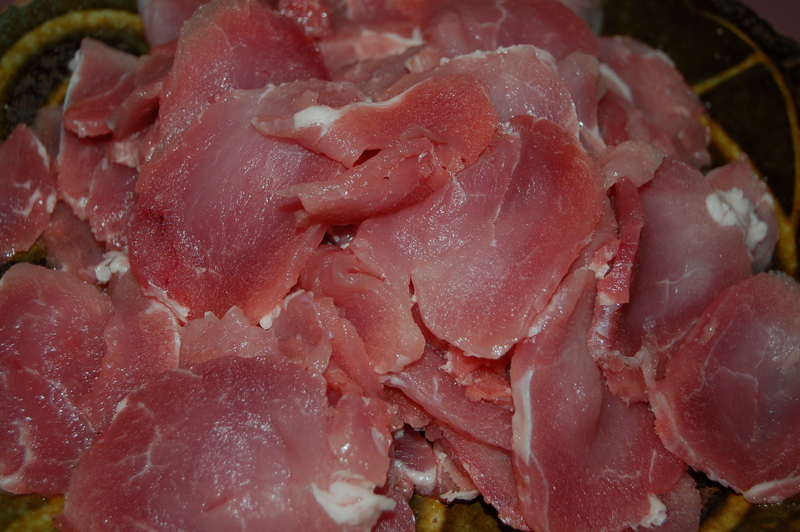 It is the meat I turn to as an alternative to say chicken or beef in a stir-fry. 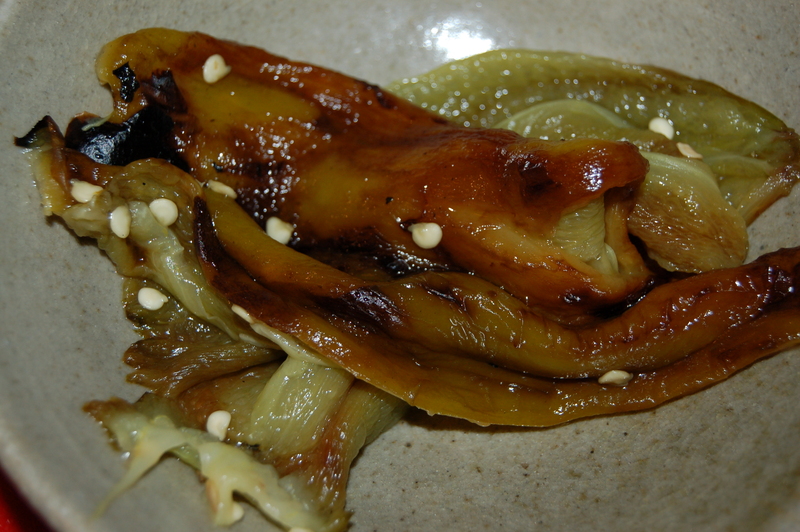 It is mouth-wateringly tender, and cooks in lightening speed when sliced thinly. When you have little time to get dinner on the table, as was the case with me the other night, (ordering Chinese was discussed), a 1lb piece of pork tenderloin can be a very handy item to have in your freezer. Actually, the fact that it was frozen was the reason I choose to make this stir-fry in the first place (look at caption on picture above). There was not much else in the fridge (a few mushrooms, a bag of green beans that were a little sad-looking, and an onion), so having a couple of key ingredients on hand saved me from ordering sub-standard take-out. I hate spending money on bad food just because of poor planning. 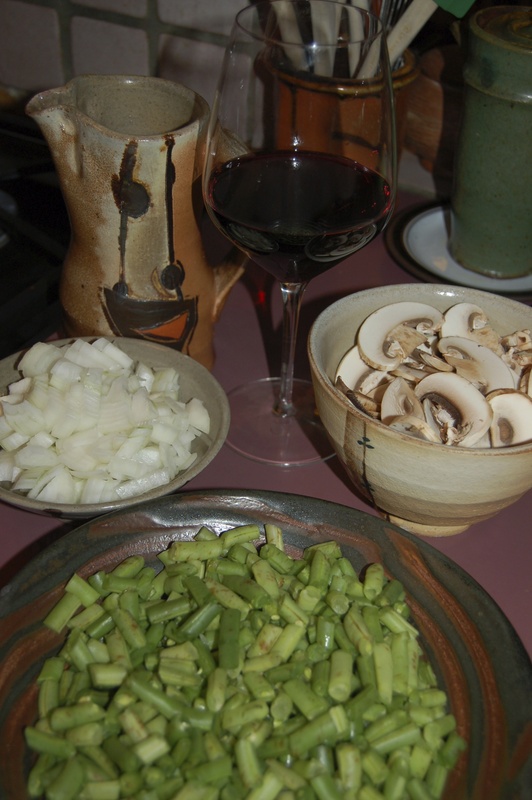 I anticipate my bad housekeeping by having some things in the kitchen with a long shelf life, namely: olive oil, soy sauce, salt, onions, some long-lasting green vegetable (frozen peas work for me), tofu, and some quick-thawing or quick-cooking meat in the freezer. So the other night when it was crunch time, I made use of all of my standbys, making me look like a very organised head-of-household indeed. 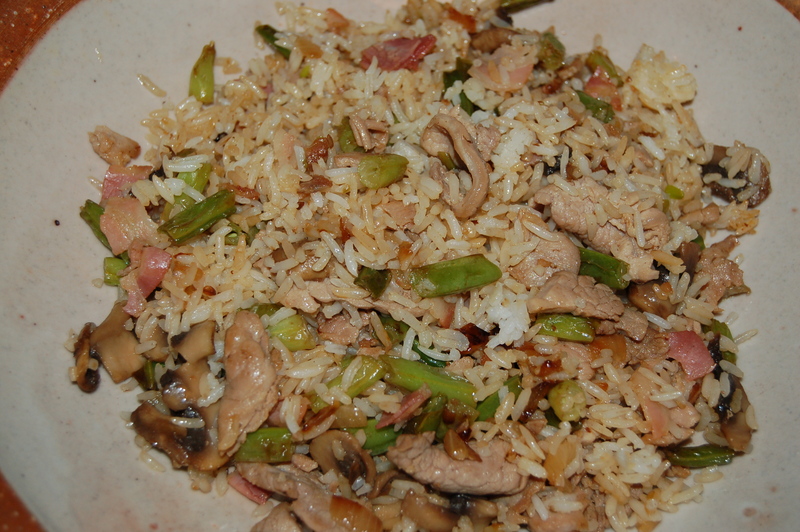 This pork stir-fry was hailed as one of my very best, so I definitely recommend you to try it! 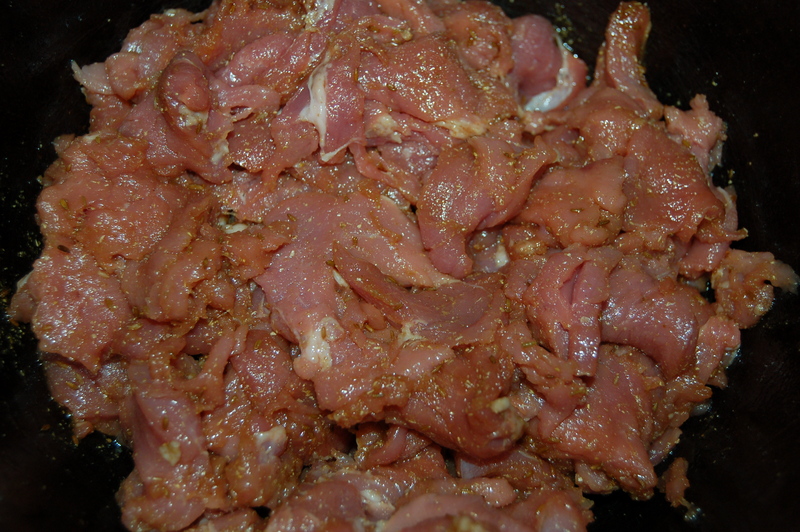 1 – Prep all veggies and meat before you begin. 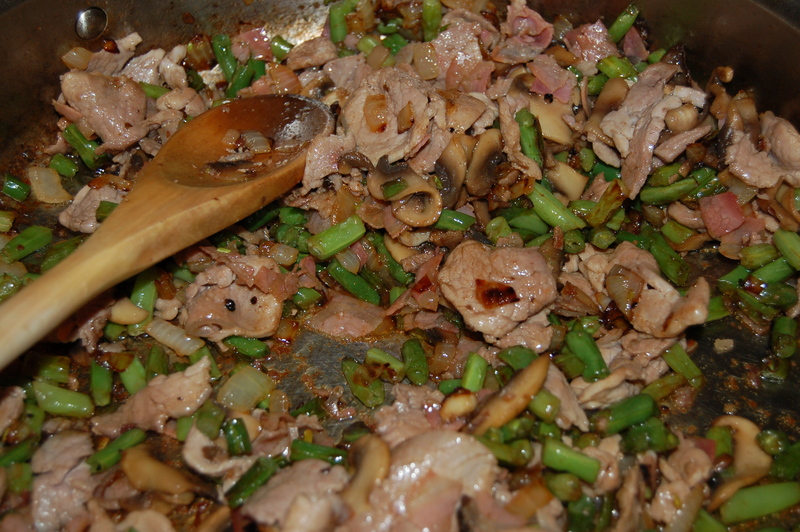 In a small bowl combine soy sauce, mirin and sesame oil. 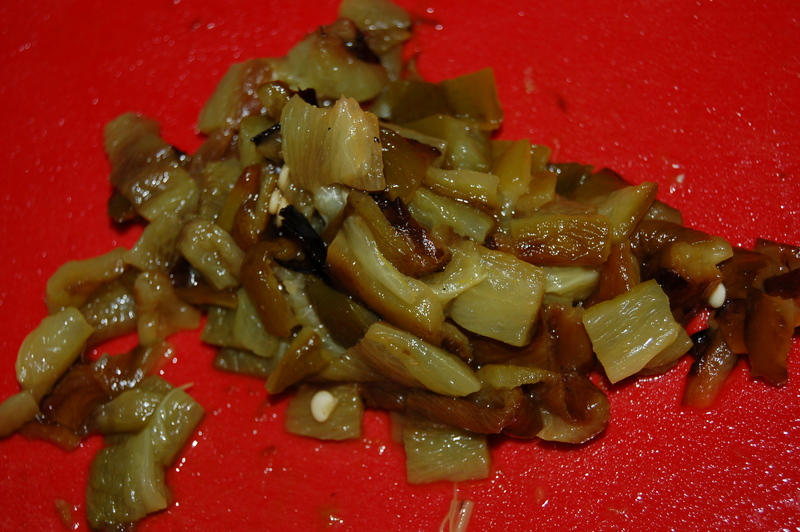 2 – Place big pan or wok on medium/high heat and add about 2 tbs oil. 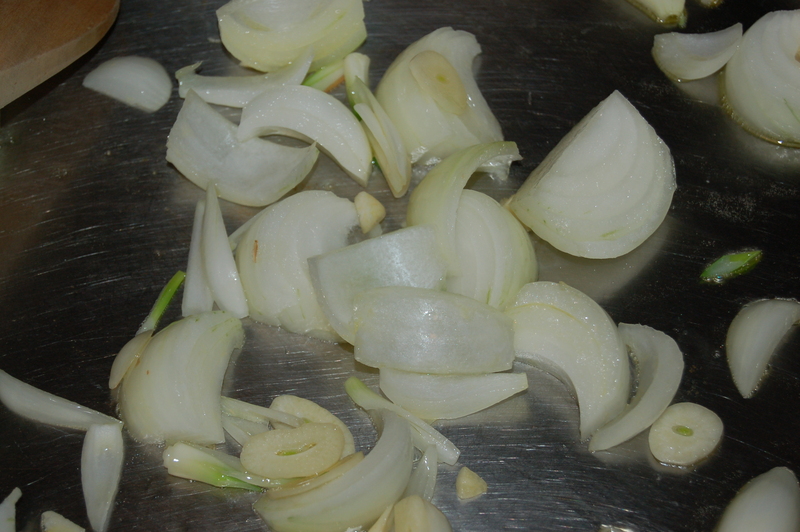 When it is hot, add the onions and cook for about 3 minutes. 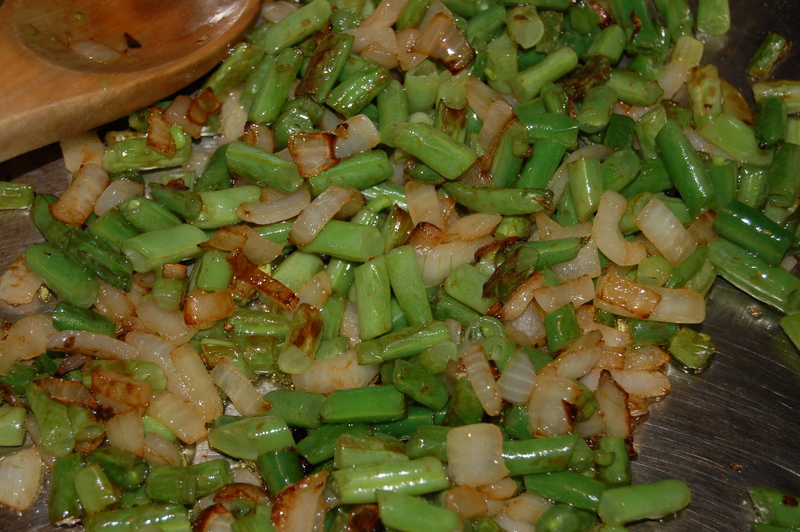 3 – Next add the green beans and continue to saute for another 5 minutes (until the green beans soften but are still toothsome). 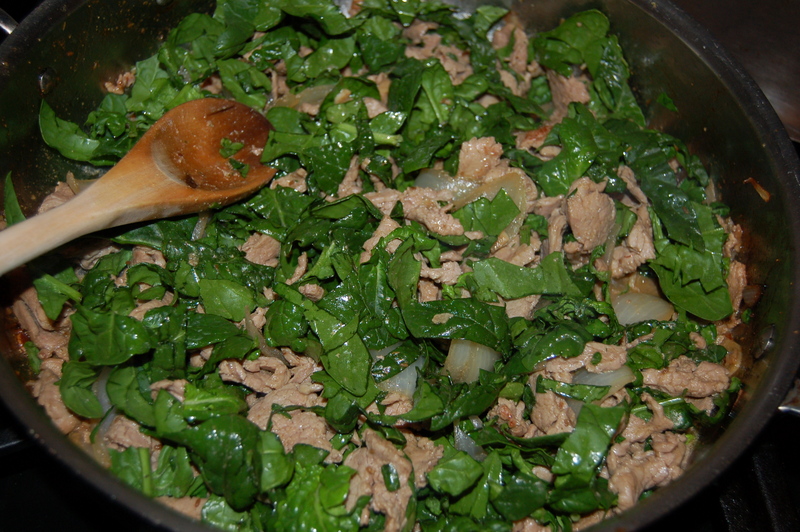 Remove veggies from pan to a plate or bowl. 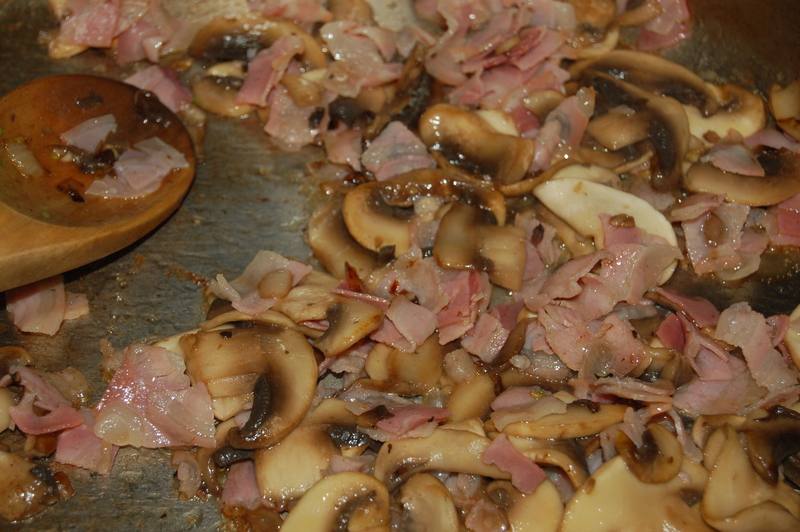 4 – Add more oil if necessary and add the mushrooms. 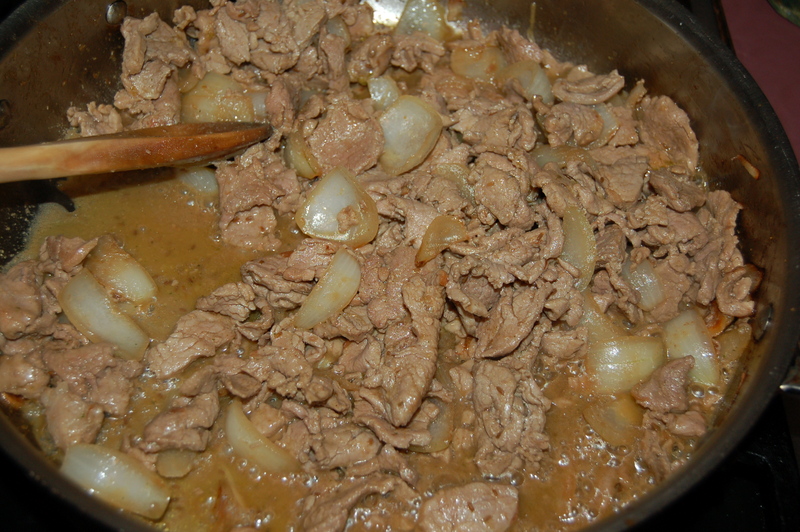 Cook until beginning to brown (about 3 or 4 minutes). Next add the diced pancetta or bacon and cook for another 4 or so minutes (bacon will need a little more time than pancetta). Add to the rest of the cooked veggies. 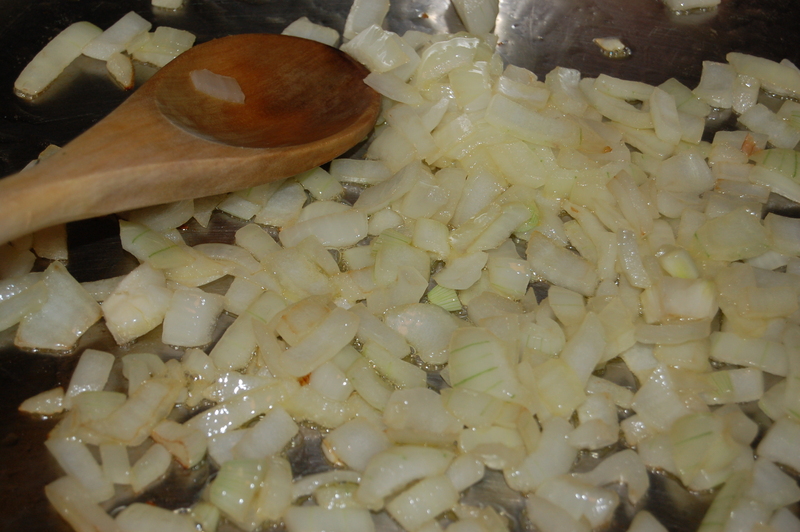 5 – Turn pan up to high and add more oil. 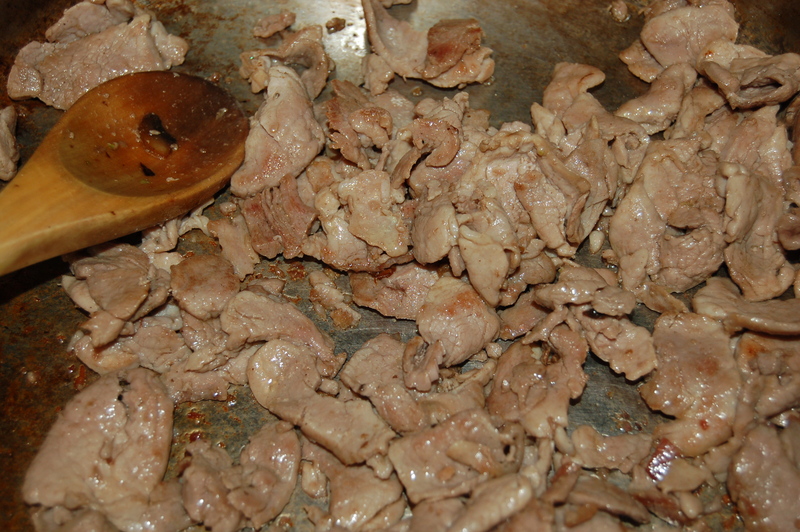 Add the pork and cook in an even layer. Do not stir or turn for about 3 minutes. Toss around for another couple of minutes until cooked (about 5 or so minutes in all. Yes, it cooks very quickly!). 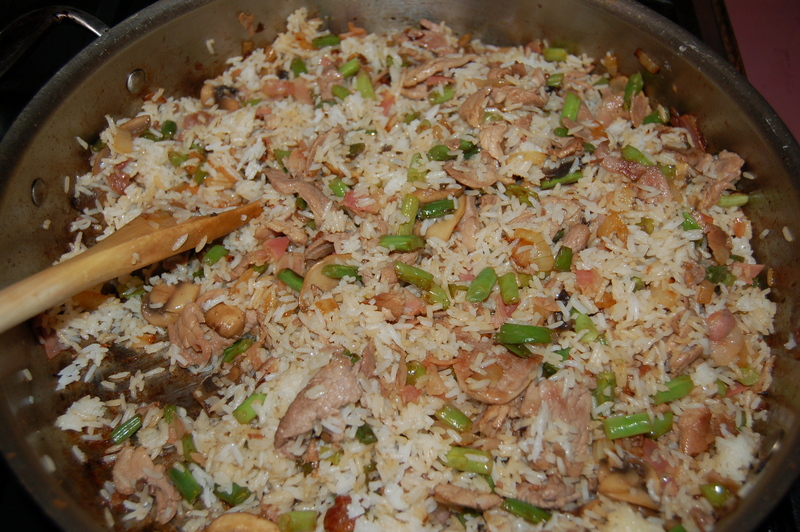 6 – Turn heat down to medium and quickly return the cooked veggies to the pan and stir. 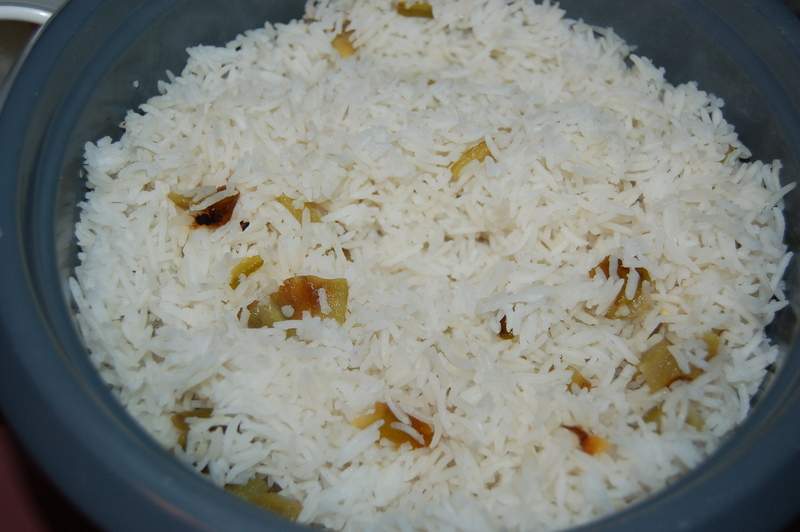 Add the rice and continue to mix quickly until incorporated. 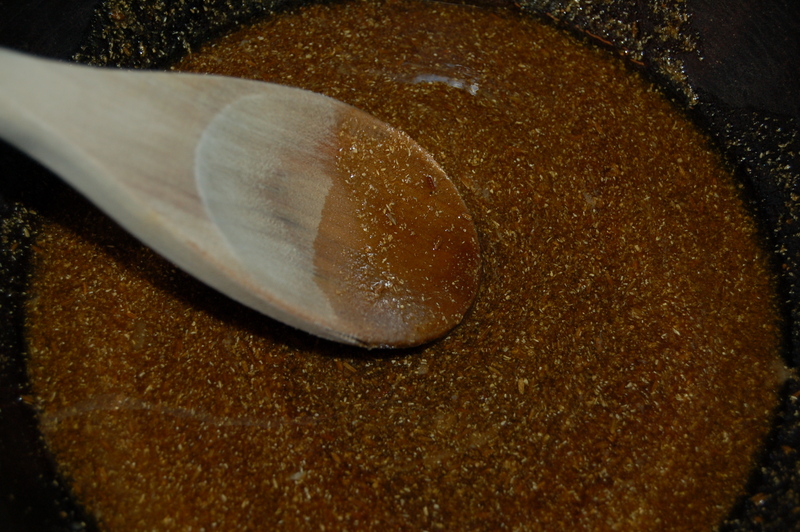 7 – Add the mirin, sesame and soy mixture and stir. Turn off heat. Serve immediately in warmed shallow bowls or plates. Pass hot sauce such as Sriracha if you like.